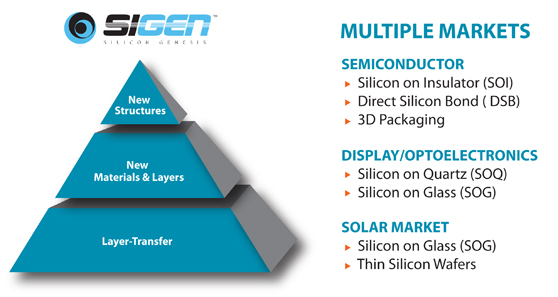 OVER THE PAST 10 YEARS SIGEN HAS AGGRESSIVELY DEVELOPED A RICH SET OF TECHNOLOGIES, WHICH ARE REFLECTED IN ALMOST 100 PATENTS FOR LAYER TRANSFER TECHNOLOGY, EQUIPMENT AND PROCESSES. The basis for this development is the firm belief that next generation devices will be built on engineered substrates to meet the ever-increasing demands of performance, power consumption and heat dissipation. and power consumption improve device speed. Transferred single-crystal silicon onto bulk glass enabling low-cost, high-efficiency solar cells, displays and optical applications. Improved device mobility in CMOS circuitry by providing separate crystal orientation layers for NMOS and PMOS. A combination of donor-layer materials on unique handle substrates, including III-V and II-VI donor materials and sapphire, ceramics and flexible handle substrates. Transferred single-crystal silicon onto a quartz substrate used for RF, display and opticial applications. Layer Transfer Technology Processes The company's proprietary NanoCleave® (Layer Transfer), NanoBond (Plasma-activated bonding), and NanoSmooth (EpiSmoothing/Epi Thickening) process steps have allowed SiGen to become a leading provider of innovative-engineered substrates through its process and technology: enabling its customers to develop new applications with greater functionality and higher speed, while improving cost, power efficiency, and heat dissipation.